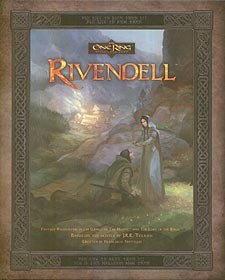 Rivendell is the first supplement for the revised edition of The One Ring: Roleplaying Game, taking the adventure west over the Misty Mountains. There lies the Last Homely House of Master Elrond, and, beyond it, the ruins of the ancient kingdoms of Arnor, Angmar and Eregiuon. The whole of Eastern Eriador is presented in detail, including new sanctuaries, locations for the heroes to explore and terrible perils to brave. Each area lists potential friends and foes, sites of interest and provides a wealth of adventure material. The supplement also introduces the Rangers of the North and the High Elves of Rivendell as playable characters, as well as a chapter of Magical Treasure and a new bestiary containing rules for powerful adversaries, undead horrors and monsters such as the Ettin and the fearsome Witch-king of Angmar. Hunt in the monster-infested Trollshaws and Ettenmoors, search for treasure amongst the tombs of the Barrow-downs (if you dare), explore the ruins of Angmar and enter the Vale of Imladris - if your heart remains true enough to find its hidden path.